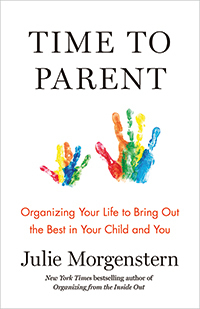 Join HRP Mamas for a speaker event with New York Times bestselling author, Julie Morgenstern, author of Time To Parent: Organizing Your Life to Bring Out the Best in Your Child and You. Parents have struggled with the time equation for generations. In the age of extra-curriculars, calendar alerts, and smart phones, the question of how to give your kids undivided attention—and still take care of yourself—looms larger than ever. Time to Parent is a take-you-by-the hand manual that shifts the goal from "having it all" to getting it right in that moment. Time To Parent is aimed at giving parents realistic, achievable methods to help them savor time with their kids and on their own. Julie’s latest book provides a revolutionary framework for helping parents create the space for quality time with their children and for themselves. The book is based on Julie’s 26 years of field experience coaching parents around the world, and extensive research in the field of child development. Julie Morgenstern is an internationally renowned organizing and time management expert, New York Times best-selling author, consultant and speaker. Julie is known for her passionate, articulate style and warm sense of humor. She has written columns for O Magazine, Redbook, and Wells Fargo helping readers’ solve problems by inspiring order in their lives. She has shared her expertise on countless TV and radio outlets, including The Oprah Winfrey Show, CNN, The Rachael Ray Show, The Today Show, Good Morning America, and The National Public Radio. She is quoted and featured regularly in a wide variety of publications and has been seen in The New York Times, Time Magazine, Harvard Business Review, Forbes, USA Today, Business Week, The Wall Street Journal, Best Life, O Magazine, Martha Stewart Living, Glamour, Cosmopolitan, Fitness Magazine and Men's Health. Julie is the author of the classic tomes ORGANIZING FROM THE INSIDE OUT and TIME MANAGEMENT FROM THE INSIDE OUT, both of which have been developed into popular specials for PBS. Julie and her teenage daughter, Jessi Morgenstern-Colon, co-authored ORGANIZING FROM THE INSIDE OUT FOR TEENS. Her workplace productivity and work-life balance tome, NEVER CHECK EMAIL IN THE MORNING, is now the basis of a popular training program conducted for the Fortune 500 and businesses worldwide. Julie's book, SHED YOUR STUFF, CHANGE YOUR LIFE, takes her message to a new level, showing people how to use the process of decluttering to 'get unstuck' in their lives. Please note: This event is for adults, but sleeping babies are always welcome!